This Tijuana Wrap for two is filled with ham, cheese and all sorts of delicious south-of-the-border awesomeness. Spread tortillas evenly with beans. 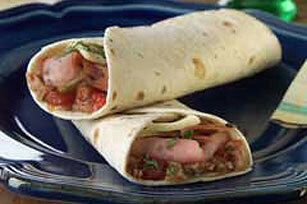 Top evenly with salsa, ham, Singles and cilantro. Prepare as directed, using OSCAR MAYER Deli Fresh Bold Brown Sugar Ham or Smoked Turkey Breast.